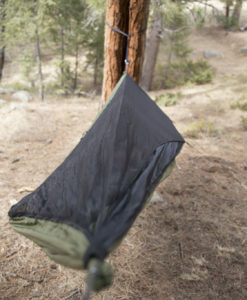 The Travel sock is a large sack made of breathable fabric that the hammock hangs inside of. It’s identical to our Travel Net in design and dimensions and only differs in the fabric used. This is used mainly in cold weather to block more wind and increase inside temperature by around 15degF. It can be used with our Blackbird and Traveler series hammocks or any end-gathered hammock up to 10’ body w/101” ridgeline length. The Travel Sock XL is the same as our regular Travel sock but it is designed to fit hammocks up to 11′ and ridgelines up to 112″. There is no more velcro-type material. It now has a simple slit at the ends that is held closed by the weight of the sock itself. You can leave it connected to the hammock and pack everything in the large stuff sack that came with the sock. It appears that they meant to give you extra room in that sack in order to do so. You could thus store and put the thing up already “assembled” and simply hook in your UQ after set up. You do not need to thread your hammock’s suspension through the ends of the sock every single time you use it. In a way, it is also like a storage snake skin, or “pig”, because you [I]could[/I] leave all your sleeping gear/UQ assembled, zip it all up attached and within the Travel sock, and put it away like that. The simple crescent shaped zipper design is deceptive in that it works ridiculously well. 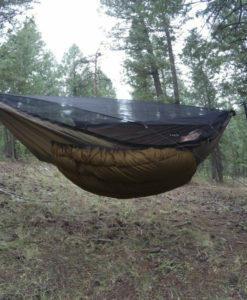 It allows venting at the “top” or near your head to the “side” but still opens completely to essentially provide a half cover that is extremely open and provides near total sock-less access to your hammock – like there was no sock at all but with protection from the wind on one side. With the sock, I can get away with using a smaller overhead tarp or even a poncho. Aesthetically, I really appreciate how much less of a “visual footprint” a winter sock consumes as opposed to the large, exclusionary enclosure that large tarps commandeer. Using a winter/wind sock as opposed to a tarp (though they can be used together) is really like using a bivy bag or bed roll when on the ground. 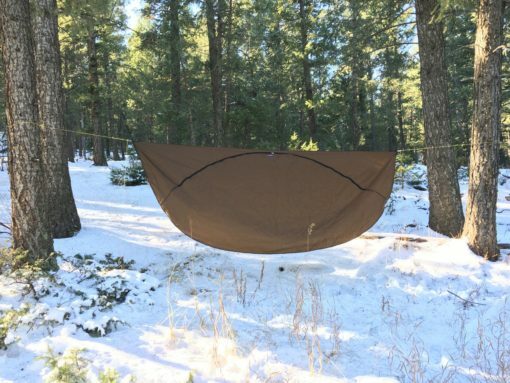 This is now a necessary part of my winter hammock gear. I have both the traveler net and traveler sock i prefer not to use any net or covering at all but i like to carry something for a few just in case scenarios. The traveler sock is more versatile than the traveler net but for bug protection in hot weather the traveler net wins. On the other hand what i like best about the traveler sock is that it takes up a lot less pack volume than the net and can be used for so many purposes. I can carry a lighter tarp and lighter underquilt because of the rain cover and heat protection of the sock. Also it can be used for bug protection with no problem. I will definatly be taking the traveler sock with me on all my trips for now on especially since it packs down so small. I use the Net and Sock with the Traveler hammock. I have used the net extensively it works just as described and can be used as a bug net when ground sleeping. The sock does really add warmth it’s incredible but I’ve only used it in cool temperatures so far, I cannot wait for this winter. The sock can be used as a bivy just like the net you really only need to hang one end and steak out the other or figure some other situation out that’s similar when you cannot hang. The Net and Sock are individually very light, each are well made easy to add on or leave out for different trips or times of the year each of these are totally worth the purchase. I love my hammock setup. i am able to set this sock up and still use my eno gear sling inside the sock and underneath the hammock without issue one thing i did find if you use the 2qzq extenders the suspension straps run through a bunched drawcord end rather than a velcro end this makes this much quieter when in use. anyhow love warbonnet and as soon as my wife is not paying attention to my debit card statement again ill be purchasing the superfly and dumping the profly. thanks B. Finally got a chance (need) to use the netting on a week long camping and rafting trip. The netting is durable, the zippers are well placed and the whole package is easy setup and use. Might be buying one for my son soon! 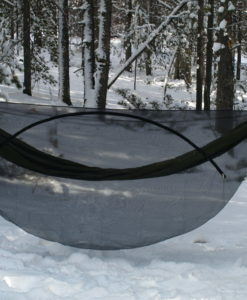 This net works fantastically with the Warbonnet Traveler hammock and its structural ridge line. There is plenty of room inside the net due to the generous amount of netting used but the net doesn’t hang down in your face or get in the way of items hanging from your ridge line. Plus, I love having the option of not using the net in the winter. 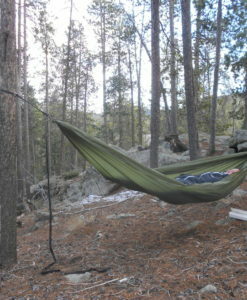 The net compresses easily along with the hammock and both fit easily inside my hammock sleeves. Overall, this was a great add-on option for the Traveler and I would buy it again in a heartbeat! I was testing out some new gear in the backyard, it was 37 degrees and very windy, I would of went inside if it weren’t for the travel sock. It shielded me and my quilts from the wind and I stayed toasty warm. It held no condensation inside and breathed well with the zipper fully shut. I found the zippers easy to use for getting in and out.. Setup was quite easy just slip the suspension lines thru the Velcro holes and done. Very nice item to have with an open tarp in cold windy conditions. This net is very light & well made. It would be nice if some simple instructions were included & there was some string pulls on the zippers. This net is definitely worth the money & comes in a nice stuff sack. I just got back from a night out with the Travel net and of course the no_seeum netting protected me all night. There are to double sided zippers so getting in and out is very easy. My friend owns the eno bug net and it weighs a ton compared to Warbonnets. Not only is the weight a plus but the opening is much larger making it so your not cut off from the group when the Travel Net is set up. Ohh yeah the price is unbelievable for all of the upgrades that this net provides compared to other bug nets. It is the best bug net on the market as far as I am concerned. Buy it now save yourself the trouble. Even making your own is a bad idea. I tried that route. It will end up costing you about the same amount of money and it won’t be built as well as this one. Just throw your money at Warbonnet and I can assure you it will be well spent. We just tried out our Traveler Socks on the AT last weekend. The temperature was 22 degrees. I installed the sock on my and my husband’s Hennessey’s and settled in for the night. The night was cold with a breeze but we were tucked in like bugs in a rug. For the midnight dash to the outhouse, the zippers were easy to find and open. I checked the temp in my hammock (temp watch) and it showed 30 so it does work to warm it up in there. Russ kept a small hole open because he likes the moving air, but he was totally content with the purchase. Good work guys! Great bug net. I am using this with my DIY hammock and it fit’s perfectly. Great quality zippers and materials. Could not be happier. I’ve bought a bunch of Warbonnet products, Brandon the owner, makes top quality gear. I purchased a Multicam sock to go w/ my Warbonnet Multicam Blackbird. Doing a lot of cold weather hanging, this sock is clutch. It’ll give me anywhere from 15* degrees + in my hammock. When it’s 30* or lower w/ snow on the ground it makes a world of difference. I love that I can now convince my wife to tag along in the cold, since she knows she won’t freeze in her hammock. Pair this w/ a Warbonnet Multicam Yeti underquilt that Brandon makes and your all set. Go one step further and pick up one of the awesome tarps they make and your golden. I chose the Multicam Superfly for myself, my wife and son both pitch a MambaJamba tarp w/ door kits. But back to the review, if you cold weather hang, grab this sock, you won’t regret it. It allows me to get out in colder weather when I couldn’t before. Warbonnet Outdoors makes great gear. Thanks Brandon!